Regardless of how good of a fish keeper we become, sooner or later, despite all of our efforts, all of us will eventually experience a sick fish. If this sick fish is sharing the tank with other fish, the first thing that needs to be done, is to isolate this sick fish from his healthy tank mates, except in the case of some external parasitic infections like Ich or Velvet, in which the entire tank would need to be treated. This is done in an attempt to prevent spreading a disease to the other fish in the tank. It also prevents the sick and weakened fish from being picked on by his healthy tank mates. Treating in a smaller hospital tank will reduce medication costs and will also prevent the fish in your main tank from unnecessarily being exposed to medications, which helps in the fight against world resistance to antibiotics. OK, so all your fish are currently healthy in their current tank. Now you want to add that new fish that you just brought home! He looks pretty healthy, right? It should be safe to just put him into your healthy community of fish, right?? Don’t do it !!!!!! Too often, aquarists take this chance and end up paying for it with a whole tank full of sick or dead fish. So, you’ve always just brought them home and added them to an existing tank without ever having a problem! That may be so, and you may get away with it many, many times, but eventually, you will get burned. I strongly recommend that you quarantine your fishy friends for several weeks before introducing them into your existing healthy community, which you have spent a lot of time, money and effort keeping this way! The Tank: Unless you typically keep fairly large fish or you will be quarantining large numbers of fish, a 5 to 15 gallon tank will probably be big enough. Besides the extra maintenance burden, there is an economic reason for using a smaller tank. In the case of a hospital tank, it is likely that you may be adding medication. When you compare the cost of medicating a 10 gallon tank to that of medicating a 50 gallon tank, you obviously will save yourself some money! I prefer to use an all glass aquarium, but in a pinch, any watertight container, such as a new Rubbermaid container or plastic bucket, that won’t leech undesired compounds into the water, can be used. The inhabitants of the tank will be uncomfortable in a small tank with a bright colored bottom and background. I suggest covering the outside of the bottom, back and even some or all of the sides of the tank with black. Black garbage bags work well for this. If you are dealing with an all glass tank, you may paint the outside glass surfaces with black paint. The tank should have a full cover (lid) to prevent your fish from jumping to their death. The Substrate: A substrate (gravel) is not required in a Hospital/Quarantine Tank. If you simply can’t bring yourself to set up a tank without gravel, then go ahead. It simply isn’t required and it does have its’ drawbacks, but it won’t cause any serious problems. The use of gravel dissipates some of the water capacity in the tank, so your 10 gallon tank may only hold 8 gallons of water after you add the gravel. This makes it more difficult to calculate how much medication to add. If you ever need to tear down and sterilize a tank after using it to house fish with a contagious disease, the gravel will have to be sterilized or thrown out and replaced. The Lighting: Lighting is not required in the Hospital/Quarantine Tank. If you decide to use it anyway, try to avoid the tank being brightly lit. The Heater: The Hospital/Quarantine Tank should include a good quality heater to reliably maintain a constant temperature. Likewise, use a reliable thermometer, such as a liquid crystal type, to monitor the tank’s temperature. Plants and Decorations: Keep decorations to a minimum but add enough to make the fish feel safe. Most fish don’t do well in a totally bare tank. Too many decorations in your tank have the same drawbacks as discussed in “The Substrate” section; water dissipation and a hassle when attempting to sterilize them. Since some medications are rough on plants, it is better not to have live plants in the Hospital/Quarantine Tank. One or two plastic plants and a decoration that the fish can hide behind or under, such as a small non-glazed terra cotta pot, should be adequate for most tanks. Miscellaneous Equipment: Nets, siphons and other tank equipment should only be used on The Hospital/Quarantine Tank and not on your other tanks because diseases can be transmitted from tank to tank when sharing such equipment between them. If there has been an outbreak of disease in your Hospital/Quarantine Tank, then such equipment should either be properly sterilized or discarded. The Water: Water in the Hospital/Quarantine Tank should have similar parameters, especially pH and GH (general hardness), to the water that the hospitalized or quarantined fish is coming from. If this is not possible, the fish will have to be acclimatized, that is, slowly gotten used to the water, before adding them to the tank. 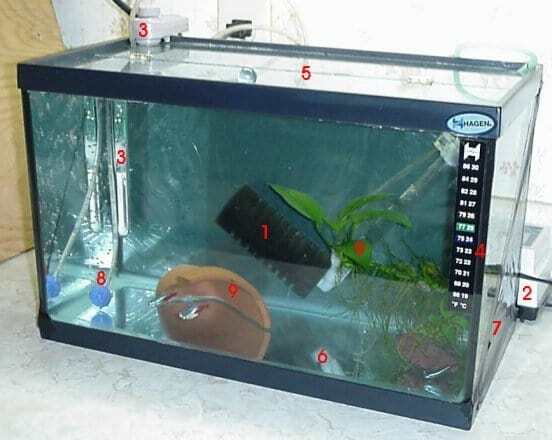 Tank Cycling: Just as you do in other aquarium setups, the Hospital/Quarantine Tank needs to go through the cycling process, though this would cause undesirable stress to the sick or newly purchased and already stressed inhabitants of the tank. Therefore, the Hospital/Quarantine Tank should be kept cycled. Probably the easiest way to keep the tank cycled is to keep a group of hardy fish, such as Zebra Danios, in the tank until the tank is needed for hospital or quarantine use. Do regular maintenance and water changes on this tank like you would any other tank. When you need to use the Hospital/Quarantine Tank, move the zebras out and into one of your other tanks or another temporary container with appropriate water conditions. Then, move the sick or quarantine fish in. In a Pinch: Keep an additional sponge filter in an established tank. The sponge will colonize with the bacteria required to keep a tank cycled. When you need to set up a Hospital/Quarantine Tank in an emergency situation, set up the tank as previously described but in addition, siphon water out of and move the sponge filter over from the established tank. Presto! Instant cycling! The tank may still go through a “mini cycling” stage, so it will be important to keep an eye on the water parameters, especially the ammonia and nitrite levels. Air pump to power the filter. Black trash bag on outer tank walls to darken tank. Safe hideouts: Plastic plant and terra cotta pot.